More and more, YouTubers and vloggers are making the jump from online media into more conventional forms like books, TV, beauty products, and even movies. And, we have to say, we ain’t mad about it one tiny bit. 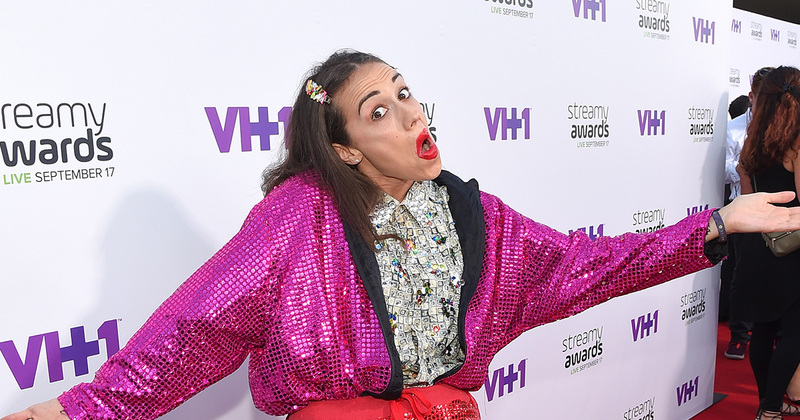 The latest YouTube star to go mainstream is Miranda Sings, aka Colleen Ballinger. Ballinger’s character of Miranda is already a cultural phenomenon all around the world, and has been on numerous world tours, has her own book, Self-Help, and has even released a filmed stand up routine. Now, however, she’s set to be the star of her own Netflix show and we’re SO excited. Known for her covers of popular songs, dance routines, and penchant for red lipstick (regardless if it gets on her teeth), Miranda’s videos have notched up 1 billion(!) streams and she has over 6 million subscribers on the platform. So, it’s no wonder that Netflix wanted to make a show about her life, Haters Back Off. Previously we’ve been introduced to Miranda via a hilarious video, and now we’re getting a bigger glimpse into the journey that she’ll be going through in the show in her search of global superstardom and it looks SO funny. The clip sees Miranda singing a cover of Christina Aguilera’s “Genie in a Bottle” as she takes on the haters on her quest for fame. Tbh, the trailer already has us nearly wetting ourselves, especially right at the end. Earlier this week, Colleen Ballinger, who plays Miranda, announced the heartbreaking news that she and her husband of one year, fellow YouTuber Joshua Evans, were getting a divorce. In a string of emotional videos, the pair shared personal details of their lives to their fans who they’ve shared their relationship with since they began dating. We hope that the pair can find some solace and work through this difficult situation. Hopefully, the release of Haters Back Off on to Netflix will give Colleen a much needed distraction. It looks really funny and she should be really proud of her work. There’s not too long to wait, too, until the show hits our screens. In fact, Haters Back Off airs on October 15th (so in, like, just over a week!). We can’t wait!